The Kenya Marathon Dinner has been held every year since 1998 in honor of the Elite Athletes from Kenya participating in the Bank of America Chicago Marathon. The purpose of the dinner is to welcome these gifted runners to the city of Chicago in true Kenyan hospitality and to give Chicago Kenyans and friends of Kenya an opportunity to meet and socialize with them. We look forward to highlighting their achievements and also expressing our community’s appreciation for the exceptional image they portray for the East African nation. The Kenya Marathon Dinner attracts a diverse group of runners and supporters from outside the Kenyan community. The guests usually relish the chance to enjoy various aspects of Kenyan culture including the authentic Kenyan cuisine and various arts and entertainment. Various local high school and collegiate track & field teams have attended the event before which gives them a chance to socialize with the elite athletes of the highest caliber. 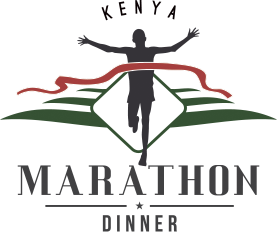 The Kenya Marathon Dinner – NFP is a registered 501 (c) 3 Not For Profit Organization entity and depends entirely on sponsorship and/or gate donations to cover all expenditure related with hosting the dinner. Previous sponsors include the Chepkwony Foundation, World Vision, Transcend The Movie, Moody Church, Kenwood Academy High, North Park University, University Of Chicago, Vision For Kenya & TopDonn Entertainment. In addition to showcasing the great running talents from Kenya, The Kenya Marathon Dinner Group also highlights various charitable foundations that are working to uplift the less fortunate in our Kenyan Society. We have worked with various charities to this end including The Chepkwony Foundation, Mama Sarah Obama Foundation & The CardoLinda Foundation.